Home » San Diego Lawyer » Happy Graduation – Welcome to Crazy Town!! Happy Graduation – Welcome to Crazy Town!! 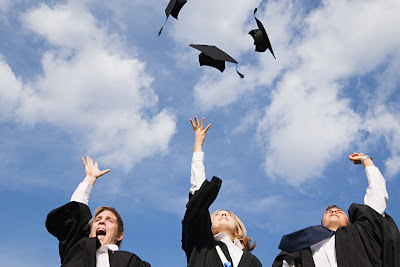 Posted on Aug 7, 2012 in San Diego Lawyer | Comments Off on Happy Graduation – Welcome to Crazy Town!! College graduation day! How cool is that!
. . . and yet there is something in the back of your mind – a little annoying thought that gives you the tingles every once in a while. It is like that dream that you have in college that you are late for the big test or you forgot to turn in your assigned project. The dream where you dream that you wake up and still cannot function properly. But finally you do wake up and you are OK – the test is tomorrow. What am I talking about? Your student loan is coming due. It’s that dream that you forgot something. The thing you forgot, after 3 or 4 years of college, is that you now have student loan debt – perhaps more than you thought you would have. Congratulation on graduating from college. Now you really are a “grown-up” (well, by some definitions) and your student loan lender will soon remind you that your first loan payment will be due in 6 months or so. No problem, you think, “I will have a good job by then” – “I’m pretty sure I will” – “I’m not worried”. . .
Student loans are the next big financial disaster that looms over the horizon. Nationwide student loan debt now exceeds all credit card combined. The problem with student loan debt is that it is easy to get and very hard to get rid of. In 2005 the Federal Government made it nearly impossible to get rid of student loans. Even if you cannot pay the loans, you cannot eliminate them in a bankruptcy. Nearly everything else can be eliminated in bankruptcy – including many taxes, but not student loans. Even student loans from a private lender are protected under the 2005 BK code. Yep. Welcome to Crazy Town! Student loan debt will keep many graduates from buying cars, traveling, renting, eating out, and basically contributing to commerce. They will not have that money to spend. Some graduates have obtained loans of over $100,000 to get a job that pays $25,000 per year. What’s my point? Avoid student loan debt like the plague. Go to cheaper schools. Get an associate degree at a community college, then finish at your dream school. And parents. NEVER get “parent student loans”. I have seen families destroyed financially because of them. Bottom line. Avoid debt – especially student loan debt.